The Combi Compact HRE gas boiler has been designed and manufactured by Intergas. 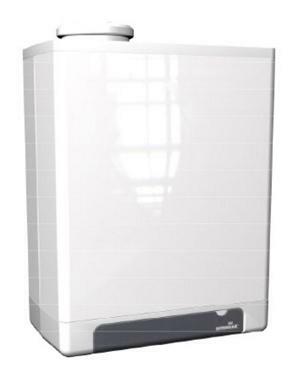 It is a highly reliable condensing and wall mounted unit with a wide range of features and benefits. A key feature of the design of this boiler is the a revolutionary condensing boiler technology to deliver energy efficiency of 88.8% (SEDBUK rating B). This has resulted in an endorsement by the Energy Saving Trust. As a Combi boiler, this model act as both a water heater and a central heating boiler wrapped into one compact unit. This means that neither a hot water cylinder nor a cold water feed tank are required which should save considerable space in your home. This boiler has no diverter valve or valve motor, no hot water plate heat exchanger and no air pressure switch. Part have been kept to a minimum to improve the boiler’s reliability. This boiler has almost no standby losses and offers you the option of either a horizontal or a vertical flue. The heat exchanger is covered by a 10 year warranty on the heat exchanger with all other parts covered by a 7 year warranty subject to the return of the warranty card.